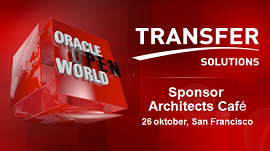 Oracle OpenWorld gives you all the latest technical information and insights. In addition to the OpenWorld sessions, we are pleased to offer you additional value by organizing a networking event specifically for the Benelux community. We would be delighted if you could join us at the Architect & Developer Café, Monday 26 October, San Francisco. At the Architect & Developer Café you can discuss your projects, the latest Architect & Developer news and smart innovations with people who share the same technology interests and Oracle’s experts. Not at all! The Architect & Developer Café is a good place for non-technical people to exchange ideas about their projects too. Please bear in mind this event is not about selling or buying, it’s about sharing knowledge in an informal atmosphere.